If I hear one more Black woman tell me that she cannot workout because of her hair, I'm going to scream at the top of my lungs until all of the glass around me shatters.... And I have a pretty big mouth so I am sure that I can do it. Having "done" hair absolutely no benefit to you when you cannot climb a flight of stairs without panting and sweating. 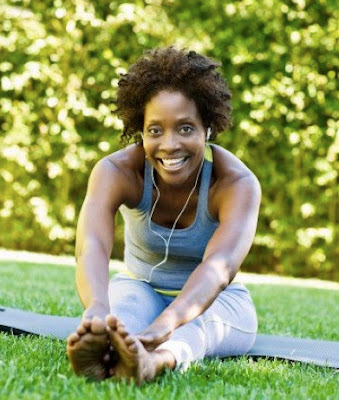 Heart disease and Diabetes affect Black women at a much higher rate than other races of women and it is because so many of us fall into the obese range. We eat too many fried foods, some of us don't practice portion control but most importantly, as a race of women we do not exercise consistently. I can already hear the tongue clicks, finger snaps and see the necks starting to roll. Inevitably someone reading this article is saying," We can't all be skinny. I don't want to look like a bone." Listen, I am certainly not advocating that all women need to be a size 4. I happily wear a size 8 and as Sir Mix-A-Lot said, my curves are kicking. But I also work out 3 days a week both cardio and weights. In fact, I am not advocating that you should wear any particular size, only that you should be healthy and part of being healthy includes moving your body. I'd rather be a healthy size 12 than an unhealthy size 4 any day because we all know that thin does not automatically mean healthy. But we have to start taking small steps towards getting healthy or we won't be around to raise our children or see the first African-American woman elected President (yeah I had to throw that in there). The most common complaint I hear from Black women about exercise is that it messes up their hair. I can't pretend that there is some secret formula that is going to allow you to exercise and keep your hair fried, dyed, and laid to the side but there are certainly some steps you can take to find a happy medium. I think naturals who wear their hair in its naturally curly state all of the time probably have it the easiest when it comes to working out and their hair. A lot of my fro wearing sistas was their hair 4 to 5 times a week anyway so they can just coordinate those wash days with their work out schedule. Naturals who get their hair heat straightened every week probably have the hardest. There is just no denying that when you start to sweat that hair is going to start coiling up. But there's still hope for you. 1) Part the hair in sections (2 or 4) and braid it up. This keeps hair from tangling while working out and it also lets your scalp breathe some. Women often say oh my hair is sweating, but really it's your scalp that sweats. So letting the scalp breathe some keeps all of the sweat from traveling down your hair shaft. After your workout apply an astringent (like Sea Breeze) to your scalp with a cotton ball and then lightly blow dry (just your scalp) on the coolest setting possible on your blow dryer. This keeps your scalp from continuing to sweat. 2) Consider wearing your hair in curly styles more often. Before my workout, I often part my hair and then twist into bantu knots and then workout. The result is the next morning I have a head full of natural beachy waves that I can shake out and go. 3) Wash you hair more often. So many of us think we should only wash our hair every 2 weeks because shampooing dries out your hair. The truth is, shampooing only dries out your hair when you use a shampoo that contains sulfates (we carry a sulfate free shampoo at http://www.deeplyrootedbeauty.com/) . If you are washing with a moisturizing shampoo that does not contain sulfates, washing your hair actually moisturizes your hair and textured hair loves moisture. If you're used to going to the salon every 2 weeks then practice washing and roller setting your own hair on your off weeks. 4) Invest in a wig that is substantially similar to your own hair. Just make sure that you moisturize your own hair under the wig. The wig makes a great protective style but you sill should be taking care of your hair so you can keep it as healthy as you keep your body. Okay, now that you have a plan for your hair, it's time to get your body in motion. Meet me at the track, I'll be the sista wearing the hot pink yoga pants. You know how I roll.... LOL! I walk every morning. I move my arms while I walk. I sweat, too! Thank God I wear my hair natural (since October 2009). I also think that we can coordinate the type of workout with how much time we can spend fussing with our hair. Perhaps weights or more low impact cardio for a shorter period of time on days when there's no time to redo the hair. And then the more intense exercises...the stuff that makes you sweat profusely you do before you wash it. Keep water and a towel nearby. Towel off and drink water throughout the workout to try to manage the sweat better. There are ways around it even if you wear your hair straight.